Until recently, firewood was taken for granted in northern Thailand. With vast forests full of many types of trees, upland households could afford to be choosy concerning the wood they used for cooking. However, in recent years, more and more communities are facing restricted access to forest products due to the establishment of national parks. 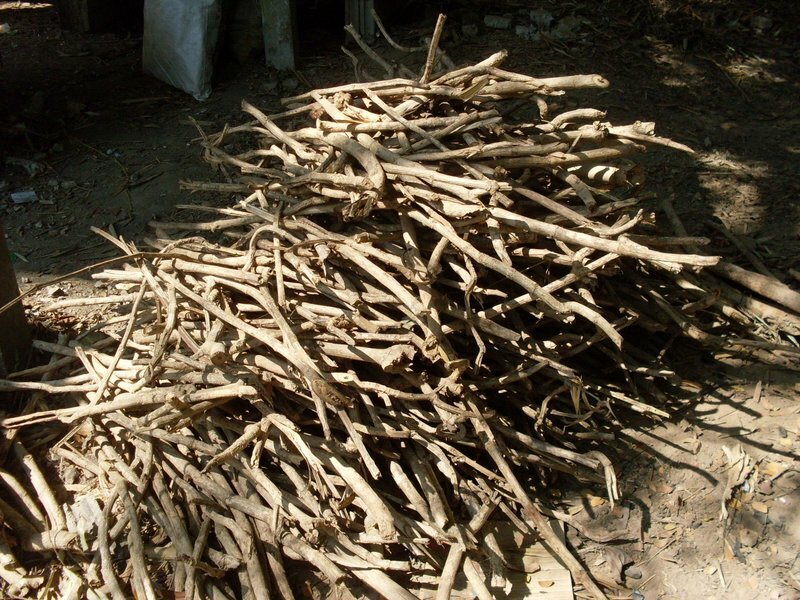 In many areas, deforestation caused by agricultural activities, such as the encroachment of large plantations, is also resulting in declining access to firewood. In upland communities, commercial types of cooking fuel like propane are not readily accessible or affordable. With limited options, communities and development organizations have begun considering alternative fuels. The Upland Holistic Development Project (www.uhdp.org), the Thailand affiliate of Plant with Purpose (https://www.plantwithpurpose.org/), has been exploring alternative cooking fuels. 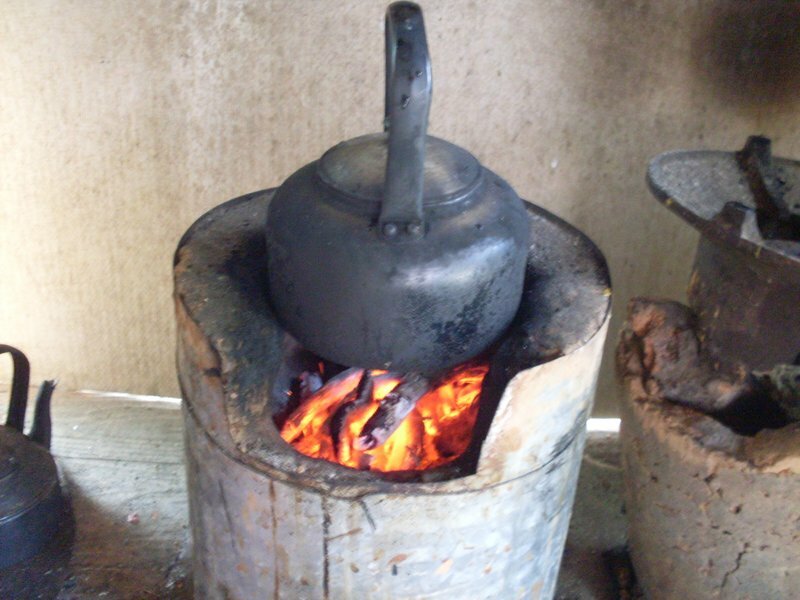 Biogas and gasifier stoves hold promise, but UHDP staff members have observed that many of their focus communities are not ready to adopt these specific approaches, partially due to the cost of materials and equipment. Charcoal is the third alternative cooking fuel being evaluated. The potential switch to charcoal is not too drastic, since local families are already very aware of the fuel. Small “bucket” cooking stoves favored by hilltribe families are generally affordable and can accommodate both firewood and charcoal. These stoves average 300 baht (current exchange is 29 baht Thai to $1 US). Energy from biomass (biological or renewable sources) includes direct wood fuel such as firewood and charcoal and plays an important role throughout the developing world. Almost two-thirds of Asia-Pacific’s population is rural, and among them, traditional biomass remains the most important source of energy (Gumartini, p.16). Although projections through 2020 show an overall declining trend for wood fuel consumption in the region, an increasing trend is expected for charcoal. According to Gumartini, the growing use of charcoal is due to increased income and urbanization (p. 19). Kittichai Sumpansinkor, UHDP technician responsible for field research and development, states that for charcoal to be readily accepted by families in the project’s focus area, it must be available, inexpensive, easy to use and of good quality. In Thailand’s north, although the consumption of composite charcoal (made from carbonized, compressed wood aggregates) is growing, traditional lump charcoal is still common, produced from the wood of culled litchee (Litchi chinensis) and longan (Dimocarpus longan) trees as well as select forest species. The cost of good quality lump charcoal currently averages 13 baht per kg. UHDP’s Co-Director, Jamlong Pawkham, estimates that the expense breaks down to approximately 4.40 Thai baht for the preparation of each household meal. This cost potentially adds up to 400 baht per month. With monthly household incomes in UHDP’s focus area rarely exceeding 4000 baht ($138 US), such expense for cooking fuel exceeds what most families are willing to pay. Sufficient quantities of charcoal are also difficult to transport into remote upland communities. In response to these challenges, UHDP and partners have been exploring the use of 200-liter horizontal drum charcoal kilns. 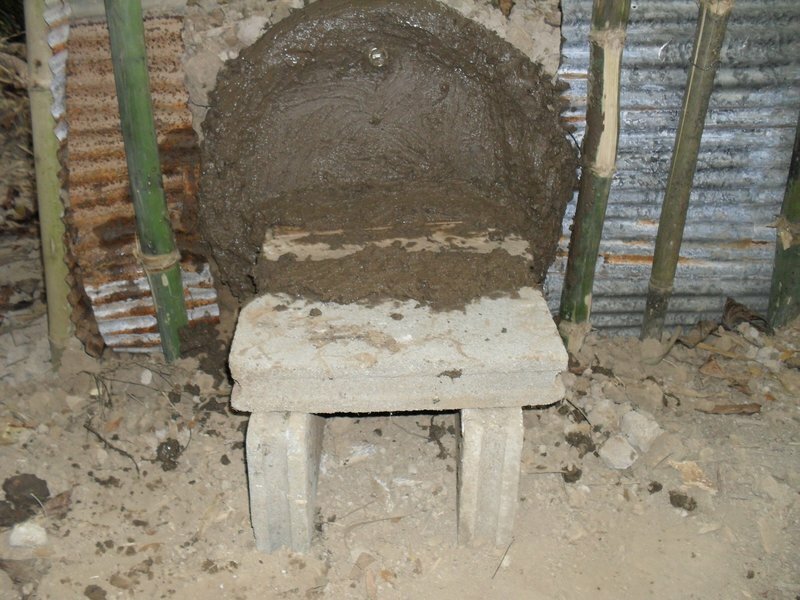 Project personnel were previously aware of the technology, but it was not until the 2009 ECHO Asia Agriculture Conference in Chiang Mai that they were introduced to technical information about the drum kilns produced by the Appropriate Technology Association (ATA; http://www.ata.or.th/th/index.php). The informative Thai-language manual (คู่มือเตาเผาถ่าน 200 ลิตร) contains numerous photos and illustrations, and details the assembly of such kilns and how they are used to produce charcoal. According to Kittichai Sumpansinkor, the 200-liter horizontal drum kiln is efficient, easy to construct and appropriate for household charcoal production. It is able to convert even small branches and farm residues to charcoal, and also yields wood vinegar, a by-product with significant farming applications (see accompanying story). Listed materials for the 200-liter horizontal drum kilns are relatively inexpensive and widely available. ATA states that kiln materials add up to 480 baht (p. 30). According to the Thai language manual Producing Charcoal and Wood Vinegar (การผลิตถ่านและน้ำส้มควันไม้), the cost of one unit is 800 baht. Such kilns can reportedly be used up to three years (Wiraphong, 42). 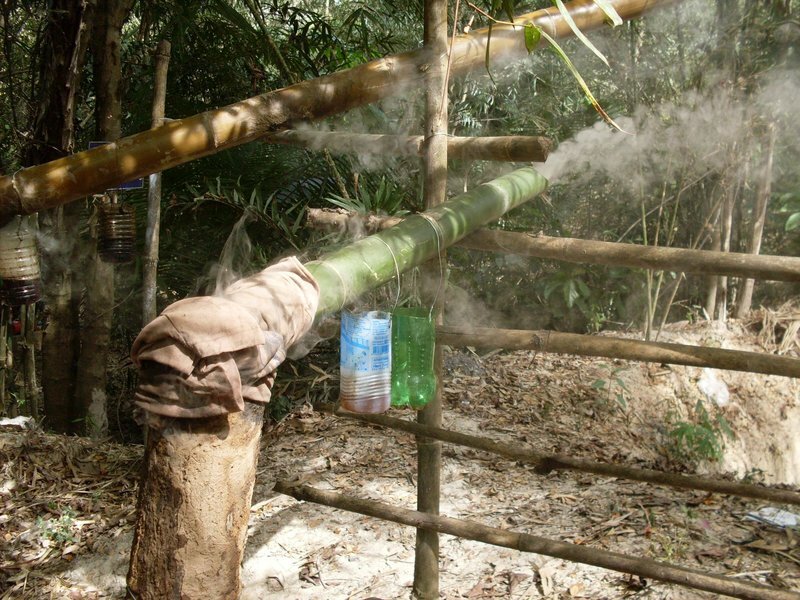 In Producing Charcoal and Wood Vinegar, Wiraphong states that practically any type of woody material can be used for charcoal production in drum kilns, including sheaths of palm branches and palm tree trunks (page 38). Chanchai Limpiyakorn, director of ATA, adds that one of the key attractions of the drum kiln is the opportunity to convert small, readily available types of biomass into charcoal, including not only tree branches and poles, but also leaves, rice straw and corn residues. However, a drawback of carbonizing such small biomass is that more charcoal dust (fines) and other small particles are produced than lump charcoal. The small charcoal particles are difficult to burn and must be mixed with binders, such as starch, and pressed into briquettes before being used as fuel (Chapter 11.2, Simple Technologies for Charcoal Making). Professor Chanchai reports that fines may also be compressed into by-product material which is used to manufacture charcoal pencils or can be sculpted into decorative pieces. As larger pieces of fuel wood—greater than 6 cm (2.4 in.) in diameter—are less available in many of its focus communities, UHDP is focusing on the production of charcoal from smaller branches and stems ranging in size from 1 to 6 cm (0.3 to 2.4 in.) in diameter. Such wood comes from locally common species such as rain tree (Albizia saman) and teak (Tectona grandis), as well as various types of bamboo. Bamboo is one of the most abundant sources of biomass in the region, and holds considerable promise as a charcoal source. UHDP Co-Director, Jamlong Pawkham, observes that bamboo has traditionally not been valued as firewood as the material burns hot and reduces quickly to ash. Compared to other desirable types of fuel wood, larger volumes of bamboo are needed for meal preparation. Therefore, the wood is only used as a supplemental fuel. Until his organization’s recent efforts, he had never encountered bamboo charcoal. India’s National Mission on Bamboo Applications asserts that slow carbonization carried out with a restricted air supply will provide good quality bamboo charcoal with high calorific value (6900 to 7000 Kcal/kg) and little ash. 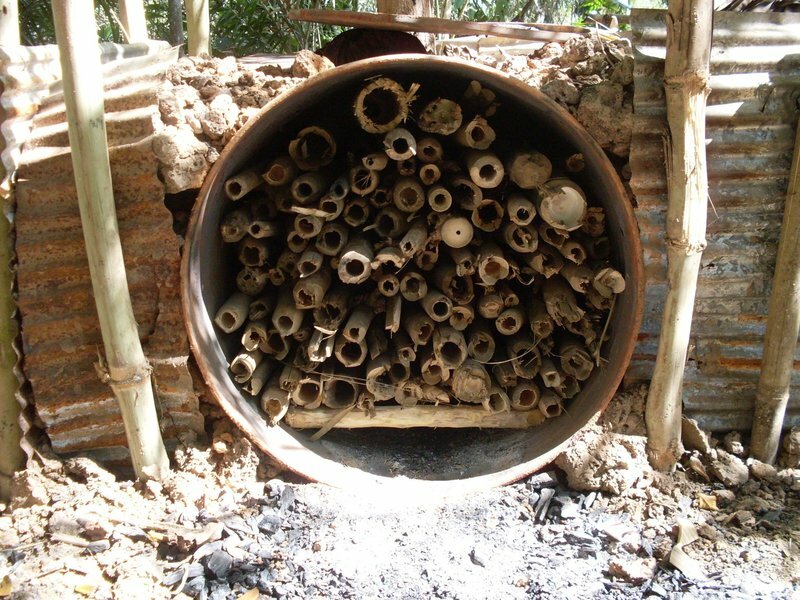 It appears that drum kiln technology can satisfy such bamboo carbonization requirements. An FAO document titled Industrial Charcoal Making defines carbonization as the process by which complex carbonaceous substances, such as wood or agricultural residues, are broken down into elemental carbon and chemical compounds by heating (Chapter 2.1). Related to charcoal production, carbonization (or complete pyrolysis) occurs when “wood is heated in a closed vessel of some kind, away from the oxygen of the air which otherwise would allow it to ignite and burn away to ashes.” Without oxygen, the wood decomposes into a variety of substances, the main one of being charcoal, which itself consists mainly of elemental carbon (Chapter 2.4, Industrial Charcoal Making). Slow pyrolysis of wood, using temperatures at approximately 500°C (932°F), is essentially the process that charcoal makers have exploited for thousands years (Lu Nan, et al. 1994). To enable slow pyrolysis to occur, various stages of careful heat management are required. Initial degradation of wood (20 to110ºC/68 to 230ºF). Wood absorbs heat as it is dried at low heat, giving off water vapor (or steam). The temperature remains just above 100 ºC until the wood is bone dry. Pre-carbonization (110 to 270ºC/230 to 518ºF). As final traces of water are expelled, the wood begins to decompose, giving off carbon monoxide, carbon dioxide, acetic acid and methane. Heat is absorbed by the wood. Initial exothermic decomposition (270 to 290ºC/518 to 554ºF). Heat evolves from the wood as spontaneous breakdown of wood continues. Mixed gases, vapors and some tar are given off. Full exothermic decomposition (290 to 400ºC/554 to 752ºF). The breakdown of wood structure continues, giving off vapors comprised of various combustible gases such as carbon monoxide, hydrogen and methane. Carbon dioxide and condensable vapors, including water, acetic acid, methanol, and acetone, as well as tars, begin to predominate as the temperature rises. High temperature refinement (400 to 500ºC/752 to 932ºF). At 400ºC, the transformation to charcoal is nearly complete. However, the charcoal still contains considerable amounts of tar which can be driven off if the temperature reaches approximately 500ºC. Guan Mingjie, at the Bamboo Engineering Research Center, E. Nanjing Forestry University, also refers to a sixth and final stage of charcoal formation, cooling, which takes place at temperatures of 60ºC (140 ºF) and below. After refinement is complete, approximately 8 hours of cooling is required to complete the carbonization process. The most basic steps of constructing and using 200-liter horizontal kilns, adapted from Producing Charcoal and Wood Vinegar and UHDP’s 200-Liter Drum Kilns, are offered below. Additional details from the illustrated English language version of UHDP’s document. Find and prepare a suitable location for the kiln at least 50 meters from any residence. Such a spot should accessible to fuel wood and be sheltered from sun and rain. It should also be located on ground high enough to avoid flooding. Level an area large enough to accommodate a 200-liter drum kiln. 200-liter drum (cut 20 x 20 cm square hole in drum lid and a 4 in. diameter hole in the bottom of the drum). Flue pipe and 90º pipe joint. Hollowed out green bamboo pole (3-5 m long; 12 cm wide) with which to collect wood vinegar. Place drum into position. Using corner posts and suitable material for retaining walls (e.g. tile, galvanized sheets), construct the walls on three sides of the kiln. Thoroughly tamp soil or sand between the retaining walls and drum, as well as over the drum. The layer of soil or sand will help insulate heat that is produced in the kiln. Arrangement of wood. Place at least 3 pieces of wood, about 3 cm wide and 25 cm long, crossways at the bottom of the kiln to serve as a grate. On top of the grate, arrange the smallest pieces of wood lengthways along the bottom of the kiln. Follow up by stacking larger pieces higher in the kiln until the largest pieces of wood are placed lengthways on top. When arranging pieces of wood into the kiln, place the large ends toward the front opening. 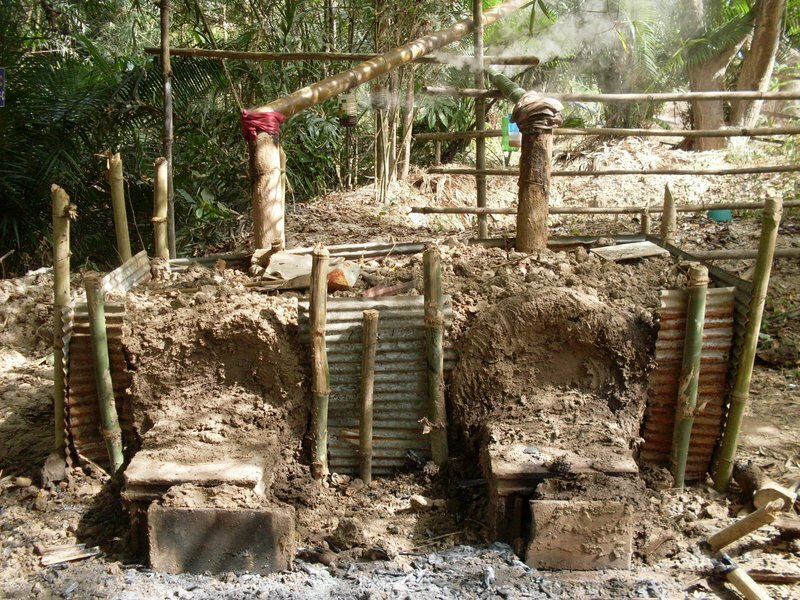 Bamboo charcoal is particularly brittle, so in order to prevent shattering, Kittichai Sumpansinkor recommends cutting bamboo poles in half before arranging the shortened segments into two adjacent stacks inside the kiln. Sealing the front of the kiln. When the drum is full of wood, seal it by placing the modified lid over the front of the drum, positioning the square opening at the bottom. Seal spaces along the edge of the lid with sticky clay or a mixture of clay and burnt rice husks. This crude seal will prevent air that would hinder carbonization (causing wood to be burned into ash) from entering the drum. Make an outer vent in front of the square opening in the lid by standing two cement blocks lengthways toward the opening with a space in-between as wide as the opening. Lay two more blocks crossways on top of the two bottom blocks to form the top of the vent. To make the outer vent airtight, use clay or the clay/burnt rice husk mixture to seal the space between the drum lid and the cement blocks as well as spaces between the blocks. Light a small fire in the cement block outer vent. Gradually insert burning wood from the outer vent into the opening of the kiln. This initial small amount of heat will help drive moisture out from the wood and from within the kiln. UHDP estimates that the time needed to heat up the kiln and drive out moisture from small wood inside will be at least 1 to 2 hours (depending on the amount of moisture and size of wood). No more external heat is needed once the smoke exiting the flue is very thick and white. Such smoke indicates that wood in the kiln is sustaining necessary heat for carbonization. Collecting wood vinegar. Approximately 30 minutes to 1 hour after you stop feeding fuel into the kiln, if the smoke is yellowish and acrid, close off most of the outer vent with the fifth cement block and seal with sticky clay. A small crack, approximately 3 cm (1.18 in.) wide, should remain open. 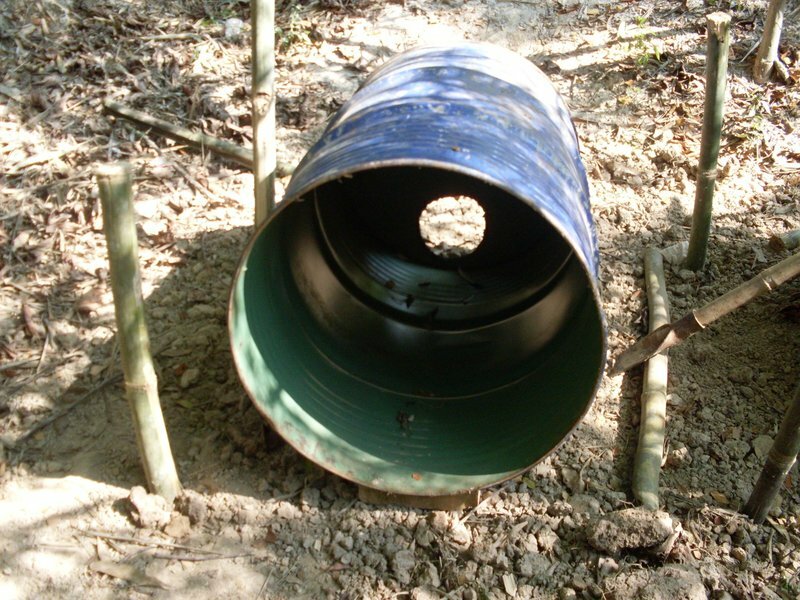 Extend a hollow green bamboo pole (far end elevated to 45º) from the flue pipe. Wood vinegar can be collected with containers fastened underneath one to two holes, approximately 2 cm (3/4 in.) wide, drilled into the bamboo pole roughly 30 cm from the connection with the flue pipe. When the smoke exiting the flue is bluish in color, reopen the outer vent about 50 percent for 5 to 10 minutes to flush out heat with fresh air. For charcoal being produced from larger wood, you can open the vent for 20 to 30 minutes. At this point, biomass inside the kiln will have been converted into pure charcoal. However, allowing the vent to remain open longer than necessary can cause the charcoal to become reduced to ashes—so following the purge of hot air inside the kiln, close the outer vent completely with the fifth block and seal with wet, sticky clay. Additionally, stop up the end of the flue with clay. This is the beginning of the cool down period. After sealing the flue and the outer vent, shift the soil or sand from on top of the kiln over to the retaining wall to enable heat to dissipate from the kiln. Allow the kiln and contents to cool 12 to 15 hours. Afterward, the finished charcoal can be removed from the kiln for packaging and/or storage. Kittichai Sumpansinkor recalls that at least a few attempts were necessary before UHDP was able to refine its approach with regard to producing usable charcoal and wood vinegar from small types of wood. Considering all of the variables (e.g., types of biomass, size, and moisture content), each charcoal producing effort will require some trial and error. 200-liter drum kilns should not be used to carbonize particularly large pieces of wood (more than several inches wide) or wood that is not yet dry, as too much time will be required for the process. Such excessive use will shorten the useable life of the kiln. According to Wiraphong, using wood that is not yet dry will not only increase the time needed to complete carbonization but will also require a considerable amount of fuel wood to be fed through the outer vent during the pre-carbonization stages. Prior to converting fresh cut wood into charcoal, at least two weeks may be required for adequate drying (p. 38). According to Kittichai Sumpansinkor, the amount of time needed to carbonize wood also depends upon its type and size. For instance, during initial trials at UHDP, rain tree branches with diameters ranging 4.5 to 5.5 cm (1.8 to 2.2 in.) required an average carbonizing time of 9.4 hours. However, teak branches, 1 to 1.5 cm (0.4 to 0.6 in.) in diameter required only 1.0 to 1.3 hours for charcoal conversion. Somewhat larger teak branches, 1.7 to 2.2 cm in diameter (0.7 to 0.9 in. ), required an average of 3.6 hours. Bamboo lengths, 1 to 3.8 cm (0.4 to 1.5 in.) in diameter, required an average of 8.1 hours to carbonize. Stassen reports that traditional earth kilns generally produce 1 kg (2.2 lb.) of charcoal per 8 to 12 kg (17.6 to 26.4 lb.) or more of wood; only an 8 to 12.5 percent yield. Improved traditional methods, such as earth kilns equipped with chimneys made from metal drums, or small-scale steel and brick kilns, have boosted production to 1 kg of charcoal from 4 to 5 kg (8.8 to 11 lb.) of air-dried wood (for a 20 to 25 percent yield). However, production of 1 kg of charcoal from 6 to 8 kg of wood (13.2 to 17.6 lb. ), yielding 12.4 to 16.6 percent, is more common for improved kilns (Unasylva - No. 157-158). According to ATA, 200-liter drum kilns produce approximately 12 to 18 kg (26.4 to 39.6 lbs.) of charcoal for each 60 to 80 kg (132 to 176 lbs.) of wood that can be inserted inside a drum kiln per batch. This is a 20 to 22 percent yield of charcoal by weight. Wiraphong reports average yields of 15 to 20 percent using the same method of production. No calorific values for various types of charcoal produced in 200-liter drum kilns were given by ATA, Wiraphong or UHDP. However, UHDP reports the following burns times for 400 gm batches of three types of charcoal (various sizes) produced in a 200-liter drum kiln compared to local market charcoal. For comparison purposes, Kittichai estimates that local meal preparation requires approximately 30 to sixty minutes. Although charcoal is considered a cleaner burning fuel than firewood, all traditional biomass fuels pose severe health threats. They are often burned in open fires or used with inefficient stoves, and the results are incomplete combustion and pollutant emissions, chief of which is carbon monoxide (Gumartini, p. 30). It is often stated that biomass is a carbon dioxide neutral fuel because it produces zero net CO2 emission. Gumartini asserts that biomass not only plays a key role in helping countries reduce reliance on imported fossil fuels, but can also play a vital role in reducing greenhouse emissions (p. 30). However, Smith et al. stress that due to deforestation and other non-renewable practices, much burned biomass is not replaced. Even with complete recycling of carbon, a biomass fuel cycle can actually produce a net increase in global warming commitment as a result of emitted products of incomplete combustion (PIC) such as carbon monoxide, methane, total non-methane organic compounds and carbon dioxide. These PICs have, on average, a higher global warming potential per kilogram of carbon than CO2. From monitoring emissions produced by various types of charcoal kilns in Thailand, Smith and associates have concluded that charcoal fuel cycles are among the most greenhouse-gas-intensive in the world (EPA). Taking into account the amount of biomass needed to produce a unit of charcoal, how will the growing demand for charcoal affect biomass sources such as forests? Girard observes that as charcoal stoves are more efficient than wood stoves, the ratio of primary energy to usable energy for charcoal is almost the same as fuel wood. Therefore, with “adequate management, supervision and control practices” the growth of charcoal use does not necessarily lead to serious impact on forested areas that supply charcoal consumption centers (Girard, Unasylva - No. 211). Should concerns over greenhouse gases prevent development organizations from promoting charcoal and other biomass fuels in response to cooking fuel needs? Is it possible that appropriate charcoal production and usage technologies might be further improved to reduce inefficiencies and emissions? In the meantime, should the promotion of small-scale charcoal production be delayed until improved technologies are in place? Or should we forge ahead with current best practices and innovations? Focus on local, renewable sources of biomass. One step forward would be to only promote charcoal production from locally renewable forms of biomass, whether waste wood (such as small branches and trimmings), agricultural residues (e.g., corn cobs) or abundantly available biomass forms such as bamboo. 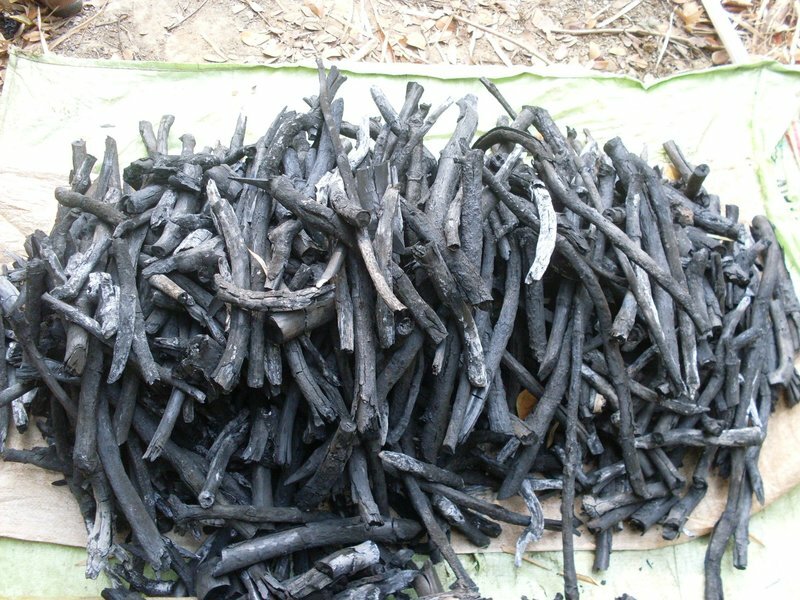 Evaluate various improved charcoal production technologies. 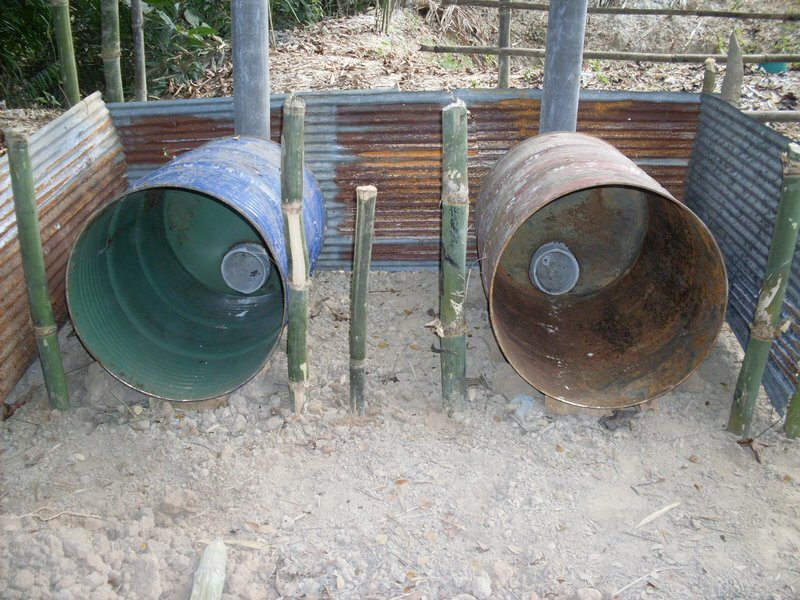 Among development organizations in Thailand and neighboring regions, the 200-liter horizontal drum is proving both effective and efficient. 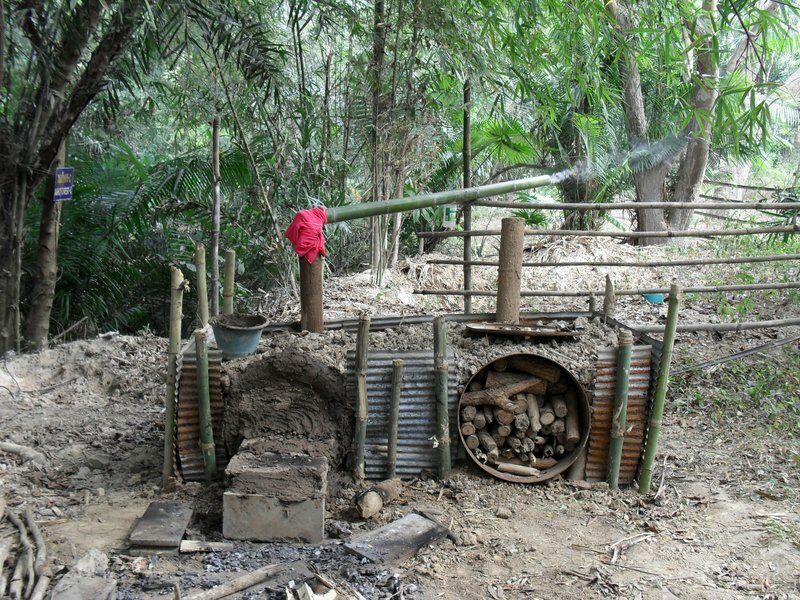 Other improved charcoal kiln technologies being evaluated and promoted in the region include Thailand’s Royal Forest Department Pit Kiln, the Upright 200-Liter Drum Kiln, the Mud Beehive Kiln and the Brick Beehive Kiln (Producing Charcoal and Wood Vinegar). These innovations vary in size and cost, but each reportedly has higher charcoal conversion yields than traditional kilns and can be used to produce wood vinegar. Improved charcoal stoves. Compared to traditional tripod potholders that simply lift cooking pots above an open flame, the common bucket stoves sold in markets throughout Asia are a major improvement. However, additional stove modifications are increasing the efficiency of charcoal and other biofuels and are decreasing the amount of smoke and other emissions produced. An excellent source of appropriate cooking stove technology is the Household Energy Development Network (HEDON) website, specifically the improved stoves resource page, http://www.hedon.info/Stoves+Database?bl=y, which contains hundreds of “knowledge base” articles related to the topic of Improved Stoves. HEDON’s “Improved Cooking Stoves” site, http://www.hedon.info/Improvedcookstove, is also full of resources. Low-cost (less than $28.00 US), because locally available materials are used to construct the kilns. Relatively easy to assemble and simple to use. Moderately long work life (up to three years if maintained adequately). Able to produce good charcoal from a wide range of locally available, renewable biomass. Wood vinegar is a valued by-product. Compared to traditional charcoal kilns, the horizontal drum kiln is more efficient with regard to the yield of charcoal from raw biomass (15 to 22 percent). Along with the use of renewable biomass and improved cooking stoves, the adoption of these small kilns belongs to a package of practices that is helping to decrease environmental consequences from charcoal production and usage. Appropriate Technology Association (ATA), Manual for 200-liter Charcoal Kilns (คู่มือเตาเผาถ่าน 200 ลิตร), Nakhorn Ratchasima, Thailand. Bhattacharya, S.C. and M.A. Leon. Prospects for Biomass Gasifiers for Cooking Applications in Asia. Asian Institute of Technology, Pathumthani, Thailand. Chanchai Limpiyakorn. E-mail message to author, September 1, 2010. Guan Mingjie. 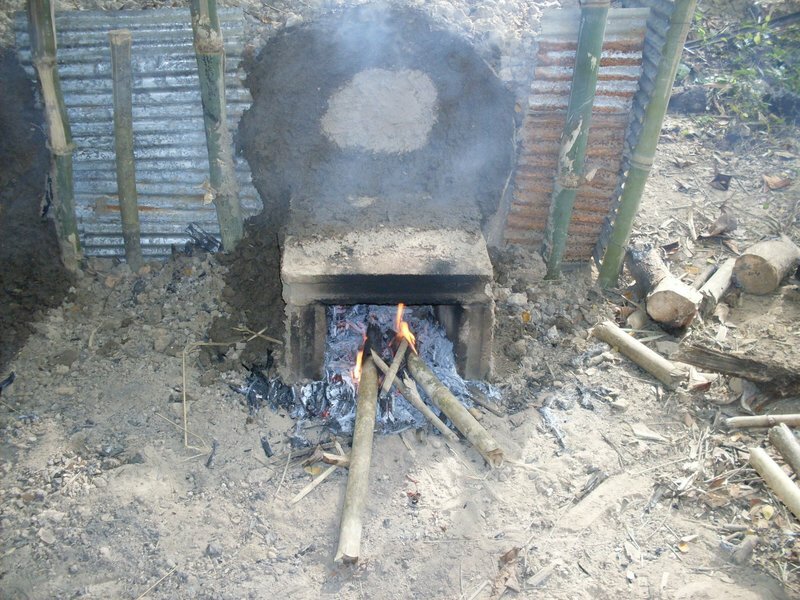 Manual for Bamboo Charcoal Production and Utilization. Bamboo Engineering Research Center, East Nanjing Forestry University. Gumartini, Tini. 2009. “Biomass Energy in the Asia-Pacific Region: Current Status, Trends and Future Setting.” Asia-Pacific Forestry Sector Outlook Study II, Working Paper Series, Working Paper No. APFSOSII/WP/2009/26. Food and Agriculture Organization of the United Nations Regional Office for Asia and the Pacific, Bangkok. Hugill, Bryan. E-mail message to author, September 20, 2010. Kittichai Sumpansinkor. 2010. 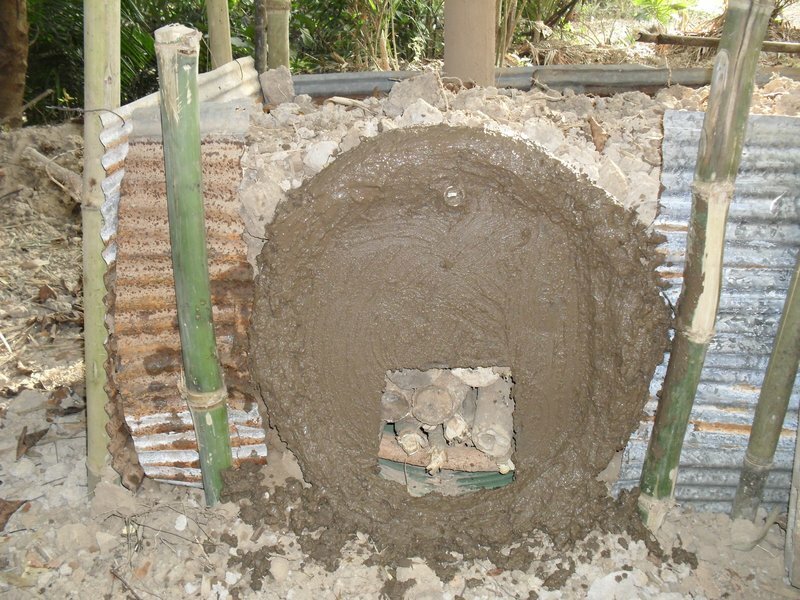 “200-liter Drum Kilns.” Upland Holistic Development Project, Chiang Mai, Thailand. Wiraphong Khuhakarn. 2010. Producing Charcoal and Wood Vinegar (การผลิตถ่านและน้ำส้มควันไม้), Kasetakam Thamachart Printers, Bangkok.